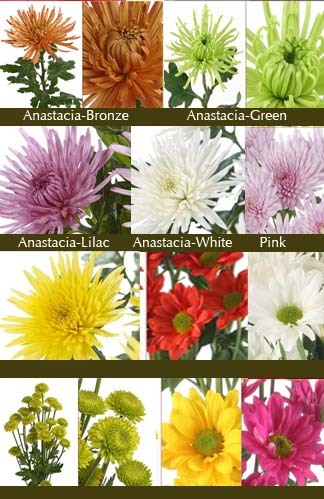 Flower Depot is proud to be growing 20 different varieties of Chrysanthemum in our Philippine flower farm. Our flower farm boasts of having 9 single standard varieties, 9 spray daisy types, santini spray types and button chrysanthemums. In fact, this is the most delightful spot in our farm; you see colors of all shades, from deep purples to lime greens. We even have purple anemones! Nature gives us the answer; if only we cared to look I have always wondered why we spend so much time looking elsewhere, for happiness, healing, pleasure, or serenity. We forget that nature envelops us, and has handed us all our answers, if only we paid attention. Take the chrysanthemum. I walk through a field of our chrysanthemums in the farm, and without even trying, my heart delights in its simple splendor. It is often called the flower of the Sun. Why? Chrysanthemums are not only delightful flowers, these charming works of art can warm and fill your stomach, have healing properties, protect you from the outside world, and while doing all this, works with nature to prevent pollution. Chrysanthemums have been used for centuries as tea and food. Yellow or white chrysanthemum flowers are boiled to make tea in some parts of Asia. The tea has many medicinal uses, including an aid in recovery from influenza. Extracts of Chrysanthemum plants (stem and flower) have been shown to have a wide variety of potential medicinal properties, including anti-HIV-1, antibacterial and antimycotic. In Chinese cuisine, Chrysanthemum leaves are steamed or boiled and used as greens. Others use the petals to mix with a thick snake meat soup in order to enhance the aroma. Have a problem with insects and bugs? Chrysanthemums are natural insecticides! The flowers are pulverized, and an active component (called pyrethrins) is applied in water or oil, or as a powder. Pyrethrins attack the nervous systems of all insects, and inhibit female mosquitoes from biting. They are considered to be amongst the safest insecticides for use around food. As if these are not enough, Chrysanthemum plants have been shown to reduce indoor air pollution by the NASA Clean Air Study.